Spotted a lovely handmade pendant from eValuestores.com again. The site is adding interesting items from time to time which kept me going back! 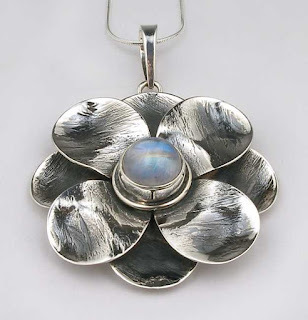 Pendant named Sterling Silver Rainbow Moonstone Pendant with 18 Inch Chain (can be found under Jewelry section), where sterling silver is paired with a rainbow moonstone in a pendant that changes hue with each breath. A raw, layered, four-leaf clover-inspired design forms the base for the piece, sometimes I love seeing how imperfection perfects a piece of jewelry. This handmade pendant involved soldering, of course, of which I couldn't do right now. Can only appreciate from far nonetheless though I've seen from book teaching how to set round shape of stones with soldering like that. - Materials: Rainbow Moonstone, Sterling Silver.